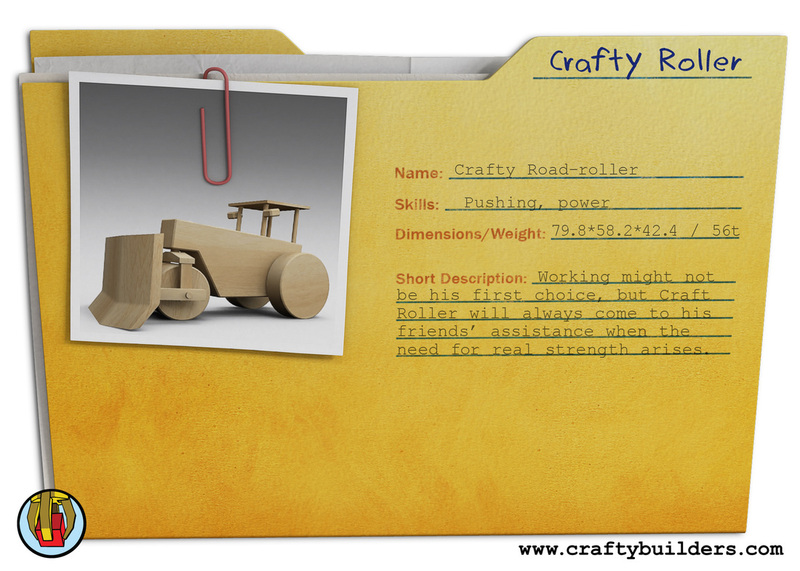 Crafty Builders are a group of five friends, vehicles who build together using wooden blocks to create wondrous objects and environments of endless possibilities. From a simple clock-tower to a far-off moon-base, from a storm in the forest to a sunset on the beach, sometimes building exciting modern structures, on other occasions ancient world monuments, the Crafty Builders adventures always take new twists and turns. Every episode presents a new task with its own particular challenges and frameworks of interactions for the builders: they might be required to display physical prowess to keep balance or struggle against gravity, or to collaborate to clear obstacles and find creative solutions to problems they are facing. Usually, Crafty Builders work together as a well-oiled team. Apart from occasional mischief by Crafty Roller, and innocent mistakes by Crafty Forklift, the mature Crafty Truck always manages to keep the work progressing with a little help from the Pushy Crane and the wisdom of the Crafty Tractor. 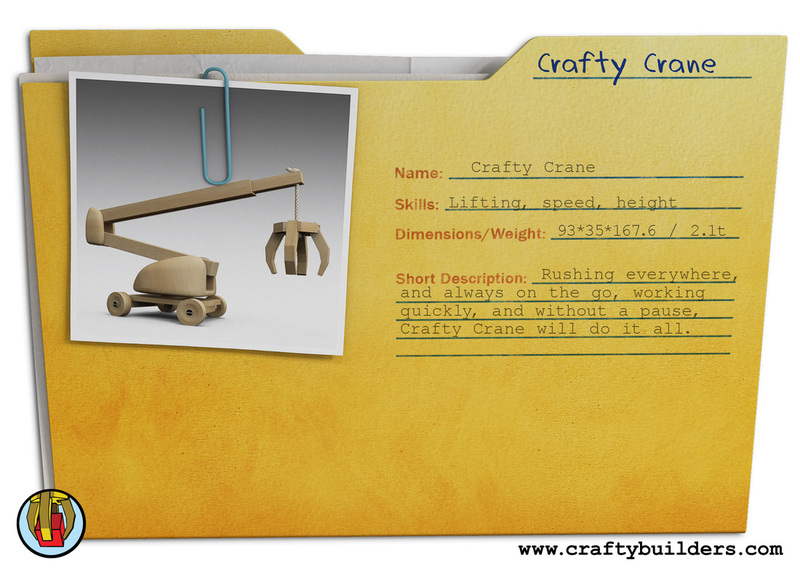 Rushing everywhere, and always on the go, working quickly, and without a pause, Crafty Crane will do it all. Crafty Crane is a fast machine, moving quickly and in a spider like fashion. His character is a tad hyperactive but very likeable and well-intentioned. He is always ahead of everyone, always around, always ready to help, and the first to solve problems. His behavior is at times headstrong, he doesn’t listen to others, and insists on doing things his way, which inadvertently leads him into trouble. 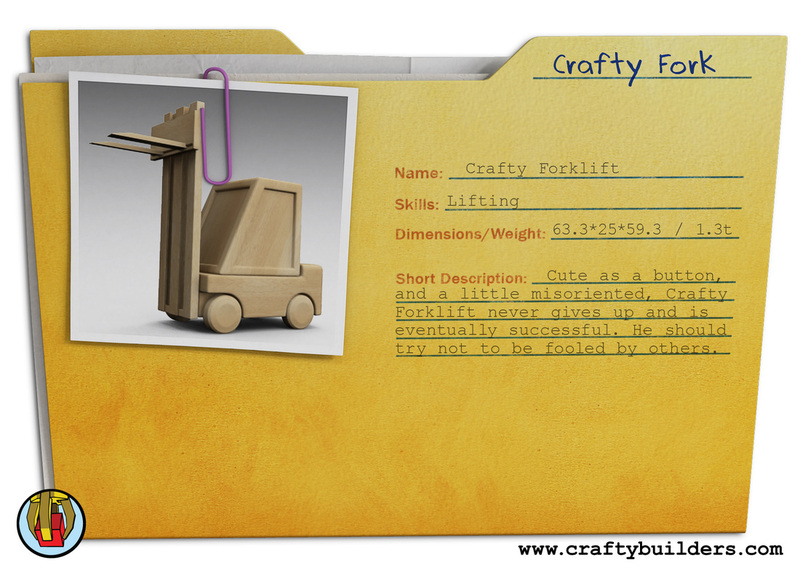 Cute as a button, and a little disoriented, Crafty Forklift never gives up and is eventually successful. He should try not to be fooled by the others. Strong and smart, and thinking deeply, Crafty Tractor is there to help all others, always up to the task and never losing his temper. 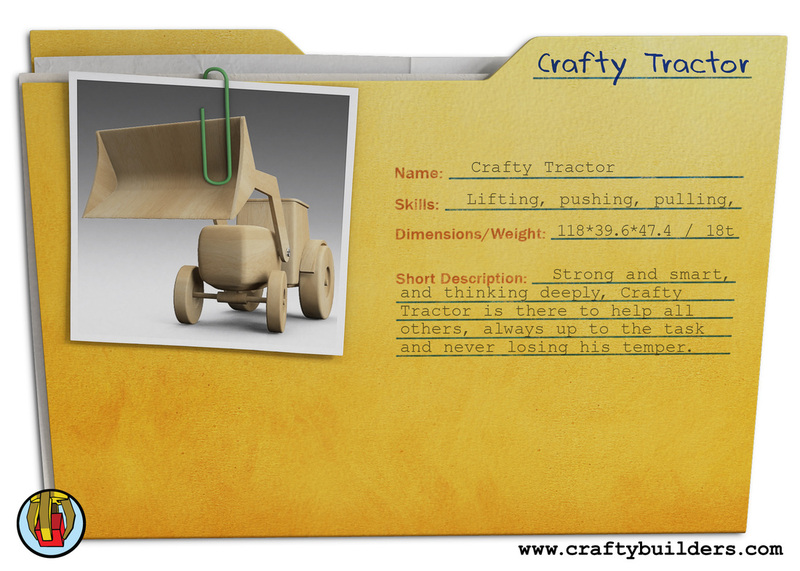 Crafty Tractor’s is a more mature and responsible character, eager to participate in every task. More often than not, he finds himself in the role of observer, not interfering and instilling his opinions, but rather there to help Crafty Builders by offering his physical strength and wisdom. He enjoys helping other characters, building with them or just hanging out with them. Working might not be his first choice, but Craft Roller will always come to his friends’ assistance when the need for real strength arises. Crafty Roller is the ‘heavy’ one of the group, and unlike the others, is somewhat indolent, grumpy and indisposed for collaboration. Sometimes he even deliberately ruins what others are struggling to put together. Despite this, he is an essential member of the Crafty Builders, being the strongest of them all, and clearing obstacles for them, if necessary. Apart from other not always liking him at all times, he rather enjoys their company and hanging around them. A natural leader, friend and mentor, Crafty Truck is a valuable co-worker and great company after work hours. 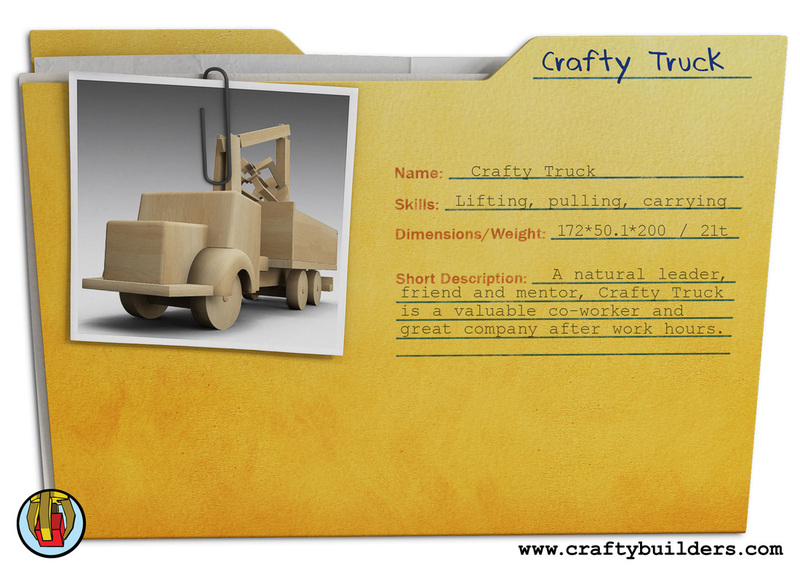 Crafty Truck is a natural leader, he is smart, strong and experienced in different fields and subjects. As the elder of the group, the crafty builders trust and follow him. Being their leader, he does not laze around, but rather participates in all the tasks, and the Crafty Builders can rely on him to ‘lend a hand’ when needed.